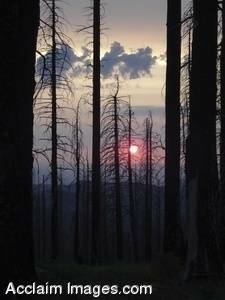 Description: Stock Photo of a Fire Damaged Forest in Oregon. This photograph was taken in June of 2006 of the damage caused by fire. The sun can be seen in the background through the burnt trees. You may purchased this photo as a poster or an art print. It is also available to license as stock photography.